A lot of recipes call for celery, but it's usually only a stalk or two, leaving you with a whole bunch of stringy, green sticks to use up. Luckily, Bon Appetit has come up with a whole bunch of uses for it, and not one of them involve ants or logs. Stock and tuna salad are obvious choices, but if you want to try something a little different, use leftover celery as a salad base. First, you're going to want to remove all of those pesky little stringy bits, which can be easily accomplished with a Y-shaped vegetable peeler. 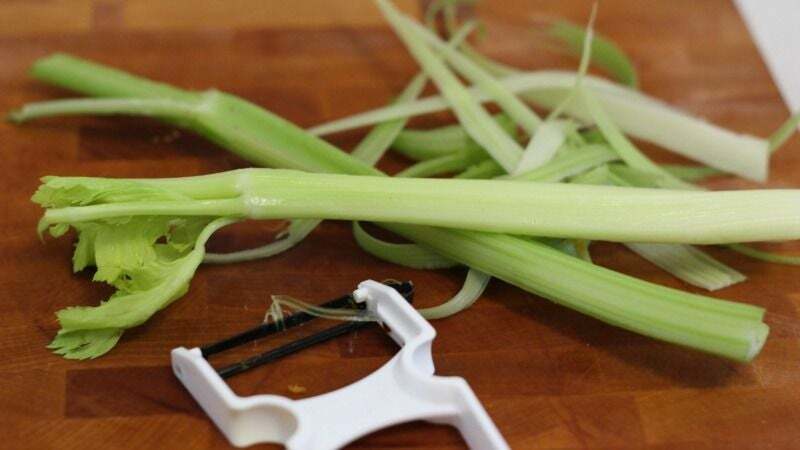 Just run the peeler down the outside of the celery until it's all unstrung. Then, keep going with the peeler, slicing the stalks up into a bunch of celery ribbons on which to build a crunchy, hearty salad. Toss 'em with some dressing, a protein and maybe some nuts, and you've got a meal. Personally, I would go for a dressing of the blue cheese variety, bonus points if there's buffalo chicken involved.